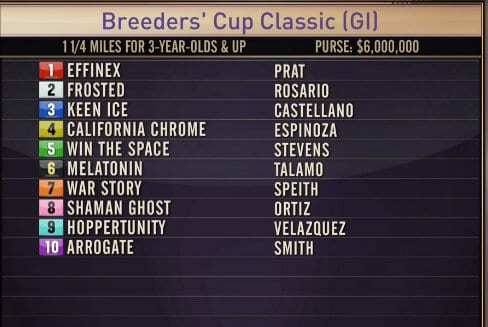 California Chrome LLC's California Chrome and Juddmonte Farms' Arrogate are the top two morning line favorites in a field of 10 3-year-olds and up set for Saturday's $6 million Breeders' Cup Classic (G1), the climax of the 33rd Breeders' Cup World Championship races to be run Friday and Saturday (Nov. 4-5) at Santa Anita. The 169 horses entered includes six also-eligibles. Among the entries are eight winners from the 2015 event at Keeneland. Going for repeat wins in the same race are Tepin (Mile), Found (Ire) (Turf), Wavell Avenue (Filly & Mare Sprint) and Mongolian Saturday (Turf Sprint). 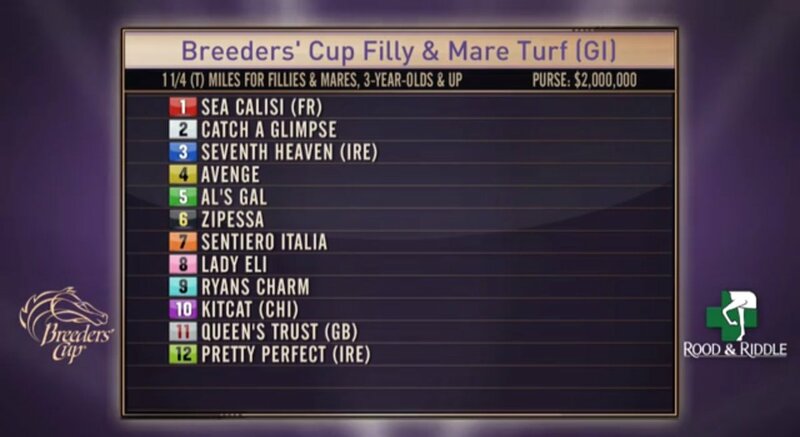 The others are Juvenile Fillies winner Songbird (Distaff), Sprint winner Runhappy (Las Vegas Dirt Mile), Juvenile Fillies Turf winner Catch a Glimpse (Filly & Mare Turf) and Juvenile Turf winner Hit a Bomb (Mile). Trained by Art Sherman, California Chrome is undefeated in six starts this year and has pushed his career bankroll to more than $13.4 million. Third in the Classic at Santa Anita in 2014, California Chrome is the even-money morning line favorite and will break from post position four under Victor Espinoza. Second on the morning line at 5-2 is the Bob Baffert-trained Arrogate. A winner of his past four starts, Arrogate exploded onto the national racing scene with a 13 ½-length victory in the Travers (G1) in his most recent start August 27. Mike Smith will be aboard the lone 3-year-old in the race and break from post position 10. Baffert, who won last year's Classic with Triple Crown winner American Pharoah and the 2014 Classic with Bayern, will have a second starter in the race in Mike Pegram, Karl Watson and Paul Weitman's Hoppertunity. Winner of the Jockey Club Gold Cup (G1) in his most recent starter and earner of more than $3.5 million, Hoppertunity will break from post position nine and be ridden by John Velazquez. Hoppertunity is 15-1 on the morning line. 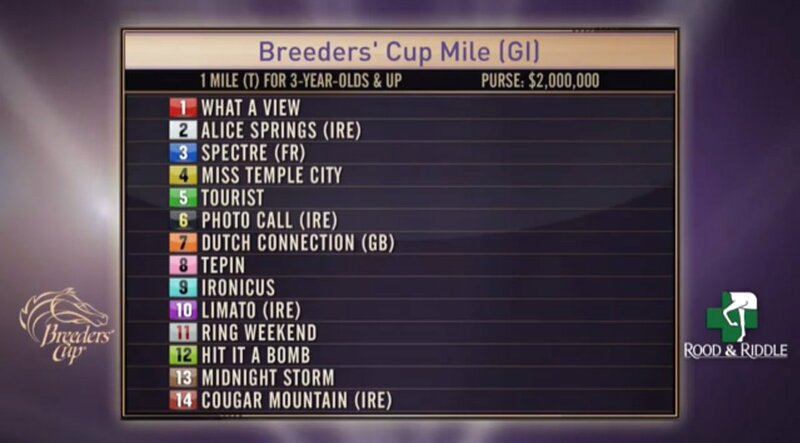 Four Championship races will be run Friday, highlighted by the $2 million Longines Breeders' Cup Distaff for fillies and mares at 1 1/8 miles and featuring champions Beholder, Songbird and Stellar Wind in a field of eight. The three marquee names in Friday's Distaff have a combined record of 47-35-8-1 for earnings of more than $9.7 million. The trio is a combined 25-22-3-0 at Santa Anita. 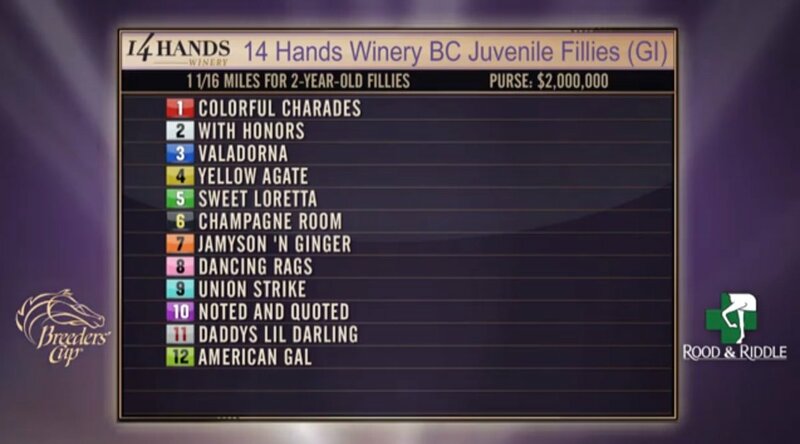 Favored at 6-5 is Fox Hill Farms' undefeated Songbird, winner of 11 straight including last year's 14 Hands Winery Breeders' Cup Juvenile Fillies as one of her seven Grade 1 triumphs, will be facing older fillies and mares for the first time in her career. The Jerry Hollendorfer trainee will break from post position one and be ridden by Mike Smith, who leads all jockeys with 22 Breeders' Cup victories. Spendthrift Farm's Beholder, a two-time Breeders' Cup winner with triumphs at Santa Anita in the 2012 Juvenile Fillies and 2013 Distaff, has been second in her past three starts. She was runner-up to Classic favorite California Chrome in the TVG Pacific Classic (G1) at Del Mar and twice to Stellar Wind in the Clement L. Hirsch (G1) at Del Mar and in the Zenyatta (G1) at Santa Anita five weeks ago. Beholder, the co-second choice at 5-2 is trained by Richard Mandella and will be ridden by Gary Stevens and break from post position eight. Hronis Racing's Stellar Wind, second in the Distaff last year at Keeneland to Stopchargingmaria, is trained by John Sadler. Listed at 5-2 on the morning line, Stellar Wind will be ridden by Victor Espinoza and break from post position five. In Saturday's $2 million Breeders' Cup Mile (G1), Robert Masterson's Tepin will attempt to beat the boys for the second consecutive year. Never worse than second in her past 14 starts, Tepin had her eight-race win streak snapped by Mile rival Photo Call (IRE) in the First Lady (G1) at Keeneland four weeks ago. Listed at 3-1 on the morning line, Tepin is trained by Mark Casse and will be ridden by Julien Leparoux from post position eight. 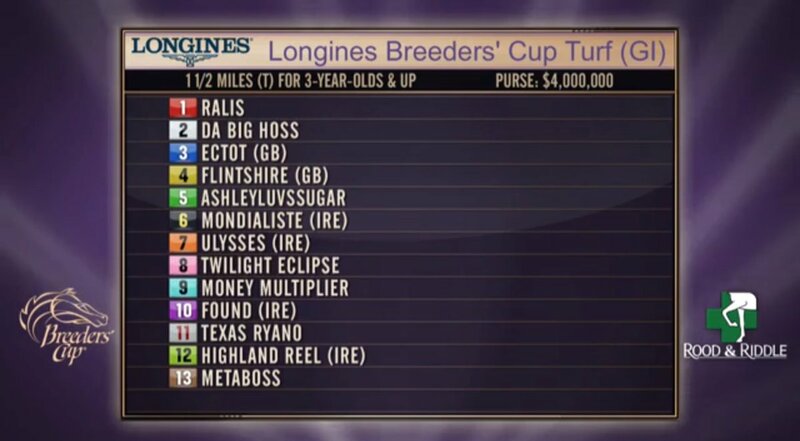 Saturday's second-richest race, the $4 million Longines Breeders' Cup Turf (G1), attracted a full gate of 14 runners and featuring North America's top grass marathoner in Flintshire (GB) and defending champion Found (IRE). Owned by Juddmonte Farms, Flintshire was second in the 2014 Breeders' Cup Turf at Santa Anita. Since coming to the United States and into the barn at Chad Brown, Flintshire has won three of four starts. Javier Castellano has the mount Saturday on the 5-2 morning line favorite and will break from post position four. Found, who upset Golden Horn to win last year's Turf at Keeneland, comes to Santa Anita off a second-place finish October 15 in the Champion Stakes (Group 1) at Ascot after having taken the Prix de l'Arc de Triomphe (Group 1) 13 days before. Ryan Moore, who was aboard for the victory at Keeneland, has the mount Saturday and will break from post position 10. Found is owned by the partnership of Michael Tabor, Derrick Smith and Mrs. John Magnier, also owners of Highland Reel (IRE), the runner-up to Found in the Arc de Triomphe. Listed at 3-1 on the morning line as is Found, Highland Reel will break from post position 12 and be ridden by Seamus Heffernan. The feel-good story of these Championships resides in the $2 million Breeders' Cup Filly & Mare Turf (G1) in which Sheep Pond Partners' Lady Eli will go for her second Breeders' Cup victory. Trained by Chad Brown, the winner of the 2014 Juvenile Fillies Turf has battled back from a life-threatening fight with laminitis to make it to Santa Anita. Second in the Ballston Spa (G2) in her first start in more than a year, Lady Eli won the Flower Bowl Invitational (G1) in her most recent start. 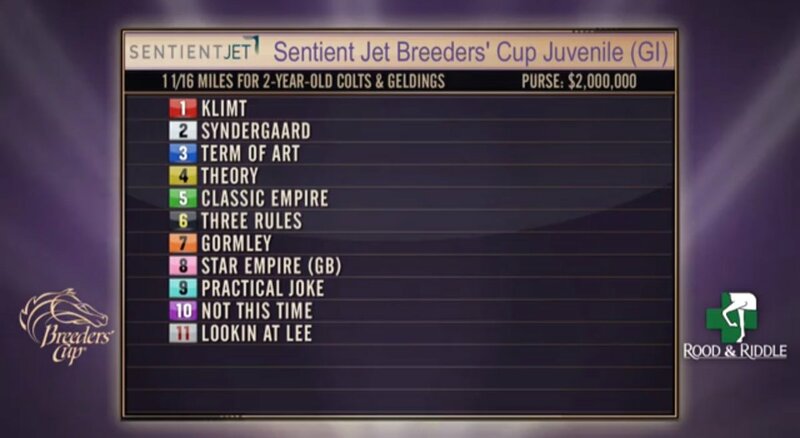 Listed as the 5-2 favorite on the morning line in the field of 13 for the 1 ¼-mile race, Lady Eli will break from post position eight and be ridden by Irad Ortiz Jr.
Five other Championship races are on the Saturday docket topped by the $2 million Sentient Jet Breeders' Cup Juvenile (G1) and the $2 million 14 Hands Winery Breeders' Cup Juvenile Fillies (G1), both at 1 1/16 miles on the main track. The Albaugh Family Stable's Not This Time, an 8 ¾-length winner of the Iroquois (G3) at Churchill Downs in his most recent start, is the 7-2 morning line favorite in a field of 11 for the Juvenile. Trained by Dale Romans, Not This Time will break from post position 10 and be ridden by Robby Albarado. Speedway Stable's Noted and Quoted, winner of the Chandelier (G1) at Santa Anita on October 1, is the 9-2 morning favorite for the Juvenile Fillies that attracted a field of 12. Trained by Bob Baffert, Noted and Quoted will break from post position 10 and be ridden by Rafael Bejarano. 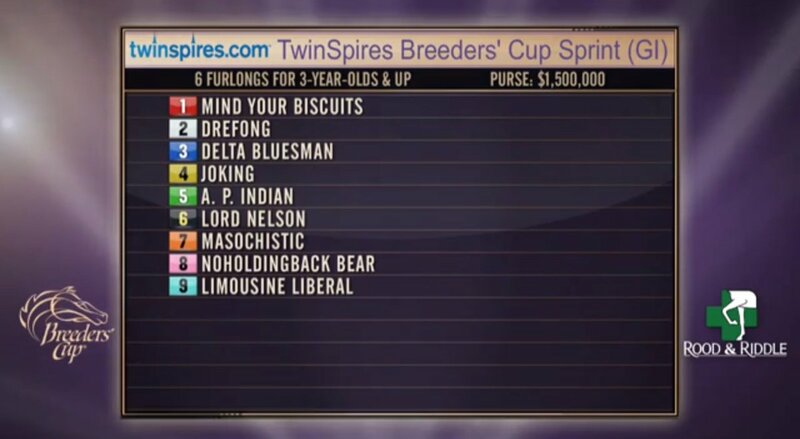 The $1.5 million Breeders' Cup Sprint (G1) drew a field of nine and features a classic East vs. West matchup among Green Lantern Stables' A. P. Indian from the East and Jay Emm Ess Stable and Los Pollos Hermanos Racing's Masochistic and Spendthrift Farm's Lord Nelson. All three runners are perfect in 2016: A. P. Indian going 6-for-6 in the East, Masochistic going 2-for-2 and Lord Nelson going 4-for-4 in Southern California with three of those victories coming at Santa Anita. Masochistic, who will break from post position seven under Mike Smith is the 2-1 morning line favorite. Lord Nelson is a 5-2 proposition and will exit post position six under Flavien Prat while A. P. Indian is 4-1 and will be ridden by Joe Bravo and break from post position five. 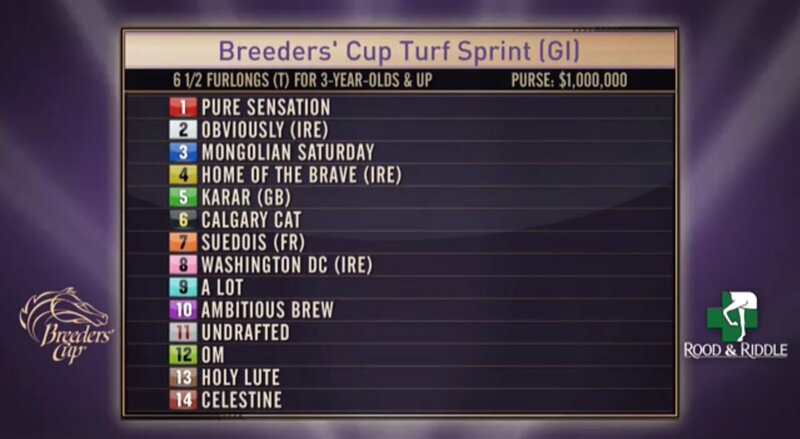 Two defending champions will be in action in Saturday's other sprints: Michael Dubb, David Simon, Head of Plains Partners and Bethlehem Stables' Wavell Avenue in the $1 million Breeders' Cup Filly & Mare Sprint (G1) and Mongolian Stable's Mongolian Saturday in the $1 million Breeders' Cup Turf Sprint (G1). However neither runner is favored to repeat. 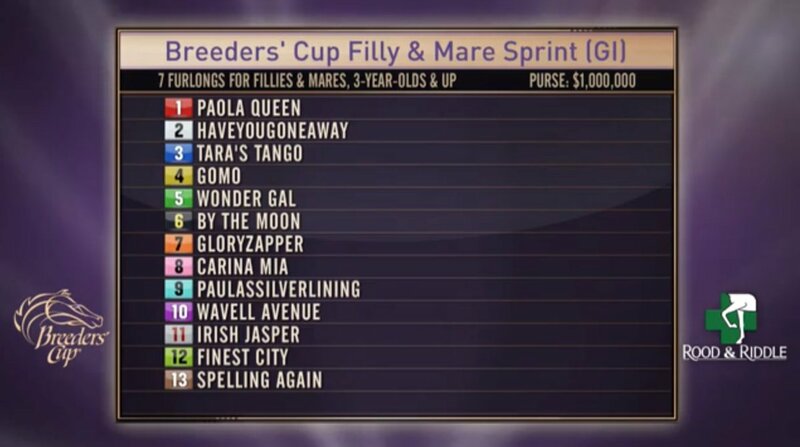 In the Filly & Mare Sprint, Gary Barber and Sequel Racing's Haveyougoneaway, winner of three consecutive starts, is the 3-1 morning line favorite in the field of 13. Trained by Tom Morley, Haveyougoineaway will be ridden by John Velazquez and break from post position two. Trained by Chad Brown, Wavell Avenue has won one of six starts this year and most recently was third to Saturday rival Paulassilverlining in the mud at Belmont in the Gallant Bloom (G2). Listed at 6-1 on the morning line, Wavell Avenue will be ridden by Joel Rosario and break from post position 10. Patricia Generazio's Pure Sensation, a winner of three consecutive starts, is 5-1 the morning line favorite in a race that drew 16 entries. Trained by Christophe Clement, Pure Sensation will break from post position one and be ridden by Kendrick Carmouche. Mongolian Saturday, who snapped a four-race skid with a victory in the Woodford (G3) at Keeneland in his most recent start, is 12-1 on the morning line. Trained by Enebish Ganbat, Mongolian Saturday will break from post position three and be ridden by Carlos Montalvo. 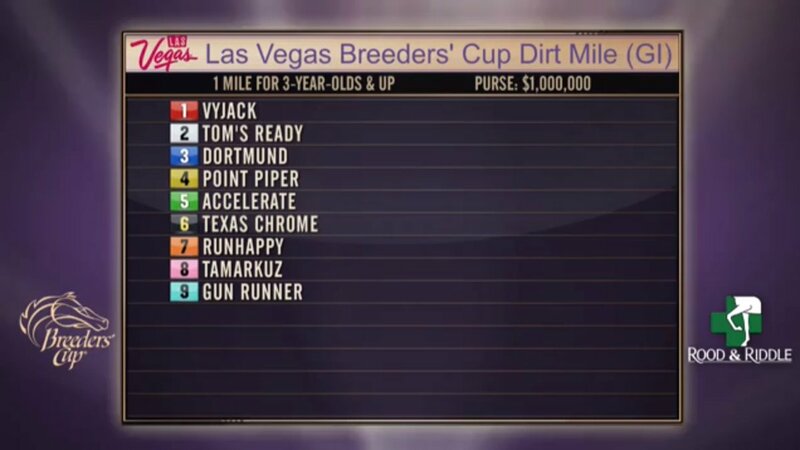 $1 million Las Vegas Breeders' Cup Dirt Mile (G1) – Kaleem Shah's Dortmund is the 6-5 morning line favorite in a field of nine with one of his challengers being James McIngvale's Runhappy, winner of the 2015 Breeders' Cup Sprint (G1), the second choice at 3-1. 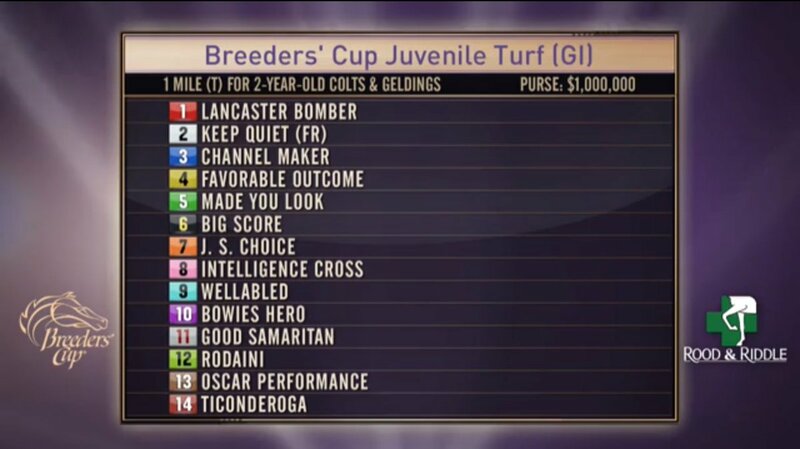 $1 million Breeders' Cup Juvenile Turf (G1) – Amerman Racing's Oscar Performance is the 4-1 morning line favorite in a field of 14 and drew post position 13. 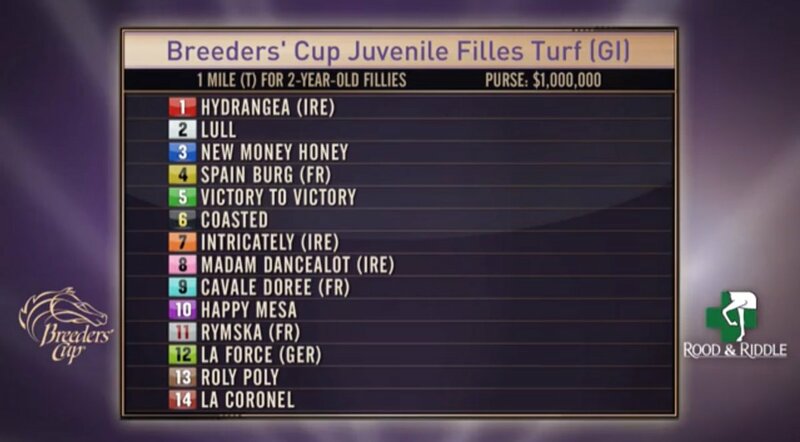 $1 million Breeders' Cup Juvenile Fillies Turf (G1) – Michael Tabor, Derrick Smith and Mrs. John Magnier's Roly Poly is the 4-1 morning line favorite and will break from post position 13, right next to John Oxley's La Coronel, the second choice at 9-2 who will try to give trainer Mark Casse a second consecutive victory in the race on the heels of Catch a Glimpse's score last year. This entry was posted in Breeders' Cup and tagged arrogate, beholder, breeders' cup classic, Breeders' Cup Distaff, California Chrome, post position draw, santa anita, songbird, stellar wind by Paulick Report Staff. Bookmark the permalink.